So go here to check out this web site and get info on how to get your subscription for only 18.00 a yr to this fabulous magazine, meet new people and even join in the challenges at the TTCRD's blog :) You will love it!!! Check out the magazine preview here :) enjoy!! My very good friend from Germany love's LOTV stamps, butterflies and the colour blue! This is the card I made for her bday last yr. and I know she would have loved it but it went MIA somewhere between here and there, along with the whole bday pkg I sent her, chock full of die cuts and embellishments and all kinds of special goodies intended just for her to bring her joy. I love LOTV stamps as well and will be making a lot more special cards for all my friends and family members soon :) Thank you so much Maria for sending me these awesome stamps, I hope I can do them justice the way the DT ladies do....oh my gosh their cards make me drool!! LOL I would love the opportunity to be a GD for this company, the stamps are easy to colour and perfectly detailed for every occasion you need. And their sentiment stamps are fabulous tooo! Love you hun, can't wait till you get to come visit me, we will have so much fun crafting together!! Please don't be upset by my post, it is ok that they didn't arrive, things happen for a reason. Consider it as you gave instead of received, I have decided that is how I will look at it from now on :O) big inky hugs and glitter wishes my sweet friend!! Ty so much for popping in to see Maria's card, I hope you like it :) Please leave me a comment so I can come see what you've been up to :) Don't forget to go visit this company, LOTV stands for Lili of the Valley, I promise you won't be disappointed!! It's a new challenge at the Outlawz and this sketch was pretty easy. I knew I was going to use this image because of it being tall and sort of narrow it's perfect. Yaaa....I know, it's another birthday card, but there are so many birthdays in our lives you can never have to many on hand. And this is one of my all time fave LOTV stamps, "Teddy Flower" I totally love this lil guy with his giant flower, he's just adorable!!! All their stamps are, makes it so hard to choose which ones to own right away and which ones can wait, LOL!! Once I picked my background paper I tried to figure out what copic colours and distress inks would work with it. I love adding dimension to my images so I used two images to create that effect for this card. The flower is glued down in the centre with tiny pop dots glued close to centre to give the flower some depth, and the leaves are cut out and glued to the paper at the stem, then pop dotted in the centres and glued at the tips. The butterflies are glued in place with tiny pop dots keeping the wings elevated. For the sweet bear I cut out his head belly and fore foot excluding the ears and back foot. TH Distress Inks scattered straw and spun sugar to do some inking on the main image edges and the side strips. She purchased my first set and two singles for me for this past Christmas (she's so sweet and kind) and I have been enjoying playing with them and experimenting with different ways to colour them. Copics, distress inks, prismacolour markers/crayons, it doesn't matter what medium you choose, they are fantastic to colour and these images make the most adorable cards. O.K. Why am I telling you this? Well, because Sat. Mar. 2nd is their 9th Birthday celebration and their havin' a P-A-R-T-Y!!!! Go here for all the deets!! As part of the celebration they are having a card competition and I figured since I have some of their awesome stamps I would like to enter a card. I'm glad I'm not competing against the DT though, those ladies got some serious talent goin' on and I'm kind of new to all this distress ink painting and copic colouring etc. But I figure the only way to learn and try to climb the ranks with the experts is to practice practice practice. So that's what I did. I got busy working on a card for the competition. I didn't want it to be just any ordinary card though, I wanted something a bit different and thought about all the different styles of cards I have made before, but they all seemed to boring for this, I wanted to make something different, hopefully something unique. One of my favourite styles of cards is an easel card and I remember seeing some cards that were called twisted easel cards and then recently I saw a double twisted easel card and thought hmmmmm maybe I could do something like that, but different?!?! This card also opens like a regular card and I decorated the inside to take a pic but I accidentally deleted it not realizing that until after I already signed it and sent it off to a friend. (thinking I was going to get the other version made) :( Oh well, when I do make the other version I have in my head I'll take a pic then and hopefully not do the delete thing again, sometime's I just don't know what I am thinking, LOL If I'm lucky (which I'm not, lol) and get chosen to be a GD for LOTV some day... I'll make that other version I am thinking of, or maybe come up with something totally different. haaa which is most likely, cause if I don't make the other one soon I'll forget to, lmbo!! Thank you so much for stopping by my blog today, sry I've been MIA for so long but life and my body just hasn't been co-operating with me and what I want to do. We are still trying to get the house ready for the market, we didn't make it this month, praying it will be by the end of March at the latest, but it certainly isn't an easy task, why on earth am I moving again, well I know why, but I can tell you if I had a choice I wouldn't be!! Have a great day and don't forget to check out the party, go get your hands on some of these amazing stamps, you'll be sooo glad you did! They are having the party on Fb too, so if your a FB fan check them out here as well. P.S. they have FREE shipping!!! This is what I found regarding a DT call, so I am not positive if it is to be on the DT or a Guest DT but that's ok, I'll know for sure when I find out if I get chosen or not right :) Either way, it's still a great opportunity!! Would you like to come and play with the Gorjussettes? If you fancy joining the fabulous Gorjussettes for a spot as a Guest Gorjussette please drop me an email with a few details about yourself and a link to your blog. Totally Gorjuss are having a DT Call. please pop an email to Net at totallygorjuss@gmail.com. I so love working with this team. Good luck to you as well if you try, and ty so much for popping by my blog today!! Have a scrap happy day, big inky hugs and glitter wishes my crafty friend. Across the miles at Thanksgiving! It's that time again and this week over at Peachy Keen it's a colour challenge. As you know it's also Thanksgiving on Thursday for our American friends and since I have a lot of crafty friends, some not so crafty friends plus a few family members that live state side, I decided to make a "Happy Thanksgiving" card!! I Hope they/you like it!! "SCENE IT!'" Create a card, layout or craft project with a Thanksgiving or Christmas scene! You have until noon EST, Thursday, November 22nd, to post your name and a link to your card, LO or craft below using Inlinkz. except I masked off happy and hand wrote "Across the miles"
The fence's were a bit of work since it cuts out two sections at a time and I couldn't really weld them together since I had cut the field in two uneven sections, which is barely even noticeable now, so I cut several out and just did a lot of cutting and gluing to get them to go with the lay of the land. I made the basket 3D by cutting it twice, adding a couple pop dots inside, then gluing the sides to each other and cutting extra apples to fill the basket up more. By the expression on the sunflowers face I think she's a little nervous that bird is hungry, LOL All the leaves above the fences are supposed to be floating down from a nearby tree after a recent big gust of wind. So they are actually in the foreground, otherwise they would have to be different sizes, which I could have done, if I had remembered I have a punch that cuts out smaller ones, doh, LOL next time!! Big inky hugs and glitter wishes!! 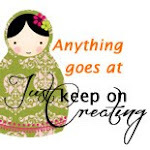 Hello there my crafty friend :) This week's challenge over at Peachy Keen is Anything Goes. I love anything goes challenges, but I have had noooo mojo all week, and I was going to settle for entering the birthday card I made for my DT challenge this week, but shortly after watching X Factor I decided to make a card for my son and daughter in law in there fave colour combo, and thought what better image to use on it but PK-328A Christmas Snowman mini. This is one of the very first stamps I wanted but one of the last ones I bought, lol! Sooo glad I have him in my collection, he's adorable!! 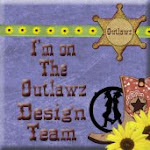 I used the two largest Labels 18 Spellbinders dies to pop my image on. I cut a brown one and trimmed off a bit on each side, then turned it side ways and pop dotted it onto the card. I cut out a white one and created the scene with a "tree" stamp I've had for a long time but not sure of the company name at the moment, have to find the tag that went MIA. Then I sponged some "blue sky" Martha Stewart chalk ink on it. Added a few swirls of glue and some Recollections fine "glitz" glitter for snow, also added some glue to the snow flake die cuts and sprinkled with the same glitter as well to give them a bit of bling. I stamped my image, coloured most of it, then paper pieced his little sweater to match the bg dp. The fur on his hat and sweater is covered with "Ice White" Viva pearl pen. I used YG17, E33, B02, B05, E33 and E35 copics to colour him in. I used an orange sharpie to do his nose, the tip is so nice and fine, I just knew I'd mess it up if I tried to get into the teenie tiny tip of the carrot. Then I cut out some snowflakes from a provocraft 2X2 die, added some $ store bling and popped them on. So glad you dropped by, please leave me a comment and I will come check out your creations :) I have to go finish leaving love on all the entrants blogs, I only got to entrant 31yesterday, now there's more than 50. There are some amazing entries, if you haven't seen them you should come over and check them out. :) Just click on the link below my pics. Ty so much, have a great week and happy scrapping! Hello there my crafty friend, always happy to see you. I hope you find a little inspiration after seeing what I've been up to :) This week is a busy week for birthdays for me. It actually started last week with my niece's on the 9th, my very good friend in Nova Scotia celebrated hers yesterday, my aunt and cousin were both born on the 15th, (mother and daughter) my cousins sons is on the 16th, (same cousin) my mother in laws is on the 19th and another really good friend of mine has hers on the 20th. That's a lot of bday cards!!! Unfortunately I have been busy busy around the house though, well as much as I can that is, my body only lets me do so much then retaliates for hrs on end :( And although I am feeling much better than last week when I felt like I had a flu bug/cold I am not having a great week pain wise. So with all this yuckyness going on and trying to get things accomplished on the house so we will be able to put it on the market soon I haven't had any mojo. I spent over a week trying to come up with a card for my Sketch Challenge over at The Outlawz. 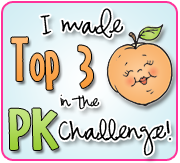 Anndddd you probably already know I love playing in the weekly challenges over at the Peachy Keen Challenge blog as well and this week is anything goes....I just haven't been able to come up with anything....yet!! Well this is the first card I got finished for my Nov. birthday list and I followed the sketch to help me create it. We have some amazingly talented designers and members submitting awesome awesome projects over there, so come on over and check us out, hopefully you will be inspired to play along. We also have many many great companies sponsoring our challenges too. I used a retired set called spring Bouquet for my main focal image which I stamped 3 times, then coloured and hand cut to get lots of dimension for the flowers and the handle of the pot. I coloured this gorgeous peachy keen image using my limited supply of copics. I am still learning so I'm no where near as talented as so many fellow crafters, someday I hope to be at least close to that calibre though LOL. I realize there are three layers to the focal image, and when I cut out the lacey circle I intended to cut out another layer in a different colour before pop dotting my image to it, but not thinking...I inked it up and forgot about that little plan LOL....but I did layer and pop dot the heck out of the flowers so I figure I covered all the layers that way, LOL And I had a totally different idea for my side embellishment as well, was planning on a really pretty large bow, but at the last second decided a gem flourish and 3D butterflies would be nicer next to all those pretty spring flowers for a birthday card. I think a ty or get well card would look fantastic with a big bow! What do you think....maybe I should make this card again and add a bow to see how it would look! Welcome to my cyber craft room. I live in Ontario, Canada. I have been married for 29 1/2 yrs and we have 3 grown boys. I love being creative as often as possible and thoroughly enjoy my Craft Room and all the tools I have collected since I discovered the ohhh soooo addicting world of paper crafts. She protects the vulnerable and brings justice to the wronged. She wears purple and green like berries and leaves and has icy blue butterfly wings.